This stuff is fascinating, it was at its most popular between the 1880s and 1920s and is made by adding uranium salts to the silica in glass production. It stopped being produced during WWII, as the uranium was being used in explosives. It started to be produced again in the late 1950s, but never on the same scale as earlier. The best part of this glass is its fabulous green glow under black light. It also reads positive on a Geiger counter, but, as I don't have one, I've never been able to confirm that. This odd looking bulbous piece is a sock darner, probably 1930s - very unusual. 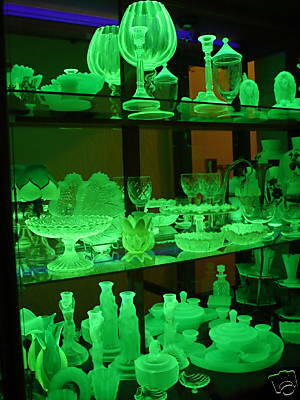 I discovered three of my vintage marbles were Uranium Glass. I also found a small selection amongst my old buttons. Check out these shots: here, here and here. Are those mushroom buttons I got you uranium glass too? Yes, the Christmas toadstools are uranium glass too! where did you get all this stuff? How radioactive is it? I'm just imagining the reaction of security people when they detect radioactivity in your luggage. We have more uranium than the Iranian nuclear program. I love your collection....and am very impressed that you found the buttons and marbles containing uranium! I've been selling the UV (black light) key chains like the one you are using in your photo. Just started my own page in fact ... http://TinyUV.com ...happy hunting!